24/7 pipe burst Coral Gables team, affordable, fast. free inspection. Did you come home to find your house to be as humid and wet as the Fairchild Tropical Botanic Garden? 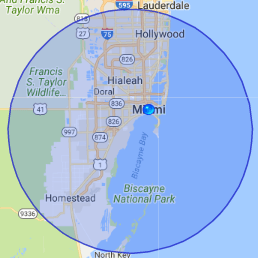 At 83 acres in size you will have a difficult time catching up with the largest tropical botanical garden in the continental United States, so you had better call our technicians at 911 Restoration Coral Gables to get to work fixing your pipe burst and drying up your flooded house! From phone call to front door we’ll provide you with same day service in 45 minutes. Rain, shine, or dark of night we’re available 24/7 to perform water cleanups and water repair. When pipes burst, we are the plumbing company you want for disaster restoration because we work with all insurance companies. Our business is licensed, insured and bonded, providing you with affordable prices and a free inspection. We value professionalism and always put the customer first using the latest drying technology. The best plumber for your plumbing leaks is 911 Restoration! Call us today to talk about our restoration services! Stay calm. Find your breaker box and shut off the power to the effected areas. Water and electricity are an extremely dangerous mix that can lead to shock and or electrocution. If you’ve got rubber boots, wear them. Once the electricity is sorted, turn off your main water supply. Especially if you don’t know where your leak is coming from, it’s important to shut off the water so it’s not causing more damage. Survey the damage and take pictures of what has been ruined. Renters insurance and home owners insurance usually cover water damage. Lastly when you want to start your water removal process call 911 Restoration Coral Gables, the plumbing company that specializes in water extraction and water damage restoration. Why are my Appliances Leaking? When was the last time you gave your washer a little TLC? Appliances don’t age like fine wine and cheese. They’re more like milk. While built to last, over time they reach an expiration date and are subject to wear and tear. Hoses can rattle free and age can cause washer bursts and ruptured hoses. Running routine maintenance checks on your appliances can prevent much water damage. How Can I Prevent Water Damage From my Washing Machine? – When installing your washing machine, or moving it, make sure to leave a three-inch gap between the back of the washing machine and the wall to avoid kinking the hose near the valve connection. – If your home will be unattended for a long period of time be sure to turn off the water supply valves to your washing machine. – We also recommend that you perform an inspection of the water supply lines to the appliance looking out for cracks, kinks, or blisters, every six months. – Ensure the water line connection is secure and replace the hose every five years. – Use mesh hoses, which are more resistant to leaks, cracking, and kinking. – Lastly, never operate the washing machine when your home is unoccupied. If a hose rattles free you might come home to a laundry room disaster that could have been prevented.